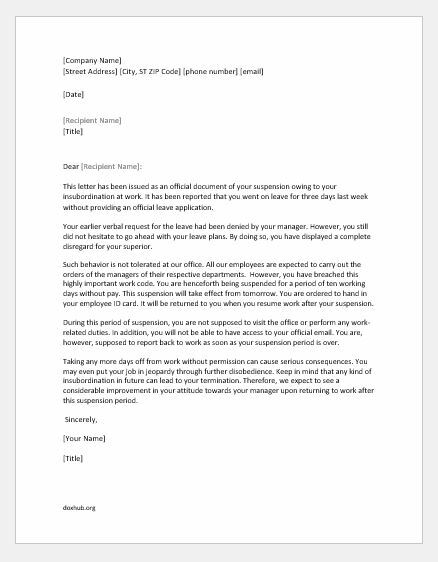 This letter has been issued as an official document of your suspension owing to your insubordination at work. 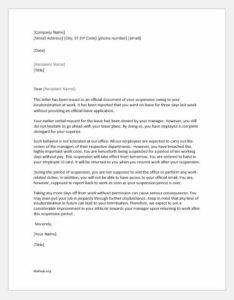 It has been reported that you went on leave for three days last week without providing an official leave application. Your earlier verbal request for the leave had been denied by your manager. However, you still did not hesitate to go ahead with your leave plans. By doing so, you have displayed a complete disregard for your superior. Such behavior is not tolerated at our office. All our employees are expected to carry out the orders of the managers of their respective departments. However, you have breached this highly important work code. You are henceforth being suspended for a period of ten working days without pay. This suspension will take effect from tomorrow. You are ordered to hand in your employee ID card. It will be returned to you when you resume work after your suspension. During this period of suspension, you are not supposed to visit the office or perform any work-related duties. In addition, you will not be able to have access to your official email. You are, however, supposed to report back to work as soon as your suspension period is over. 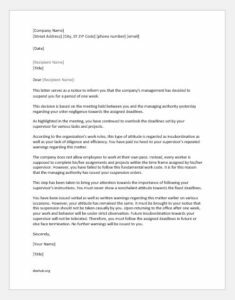 This letter serves as a notice to inform you that the company’s management has decided to suspend you for a period of one week. 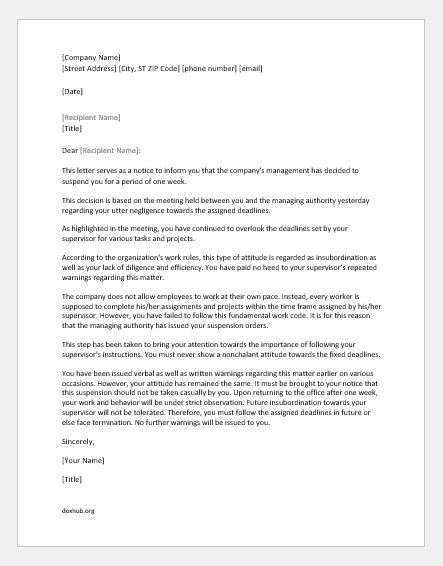 This decision is based on the meeting held between you and the managing authority yesterday regarding your utter negligence towards the assigned deadlines. As highlighted in the meeting, you have continued to overlook the deadlines set by your supervisor for various tasks and projects. According to the organization’s work rules, this type of attitude is regarded as insubordination as well as your lack of diligence and efficiency. You have paid no heed to your supervisor’s repeated warnings regarding this matter. The company does not allow employees to work at their own pace. Instead, every worker is supposed to complete his/her assignments and projects within the time frame assigned by his/her supervisor. However, you have failed to follow this fundamental work code. It is for this reason that the managing authority has issued your suspension orders. This step has been taken to bring your attention towards the importance of following your supervisor’s instructions. You must never show a nonchalant attitude towards the fixed deadlines.